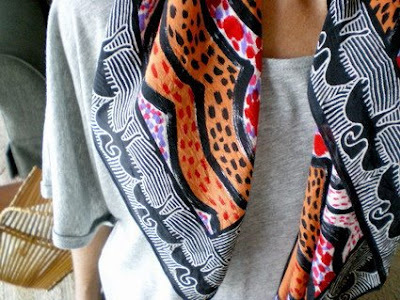 I WASN'T sure when I bought this silk scarf for a mere 50c whether the images were Aboriginal, or not. I'd never been keen on Aboriginal art until I travelled to Uluru a couple of years back. That land, that space ... it is magical. Go if you ever get the chance. Go. Anyhoot, the clue was the name Jimmy Pike. It was printed in the corner of the scarf and I promised myself I'd Google it. Well I did. Pike, who died in 2002 (so I should warn Aboriginal people I am writing about a deceased Walmajarri man) was from the Kimberley region. He was a painter and printmaker. I feel like his work found me, not the other way around. An exciting find...and doesn't the design look great on fabric..
its fab and looks perfect with the marle grey! im after a vintage scarf with purple, navy blue and white...wish me luck! Very nice indeed! I wonder when it was made? I went op shopping once and found an attractive velvet maxi skirt I thought I'd wear to a party - on closer inspection it turned out to be a genuine Pucci orignal circa 1960 - picked it up for a song!! Beautiful find. I've dug up a few old Liberty of London scarves for a song. It's always a thrilling moment to find something with a name on it, even when you don't know the designer. It makes it more personal, somehow. I remember Jimmy Pike from a clothing range which featured his designs. Can't remember the label...not enven sure if it's still around. Another great find.